It is such a joy to be back on my blog and back in this community I am grateful to belong to, dear readers. I have a lot to tell you and pictures to share after returning home from…(It will be a surprise in my next post) But for now I would like to share something very meaningful to me. Before I tell you more, let’s take a pause, sit comfortably in the sun or in the shade, and enjoy a cup of tea or a glass of your favourite fruit juice. I am so happy to tell you about a book I read recently, that I loved for many reasons. 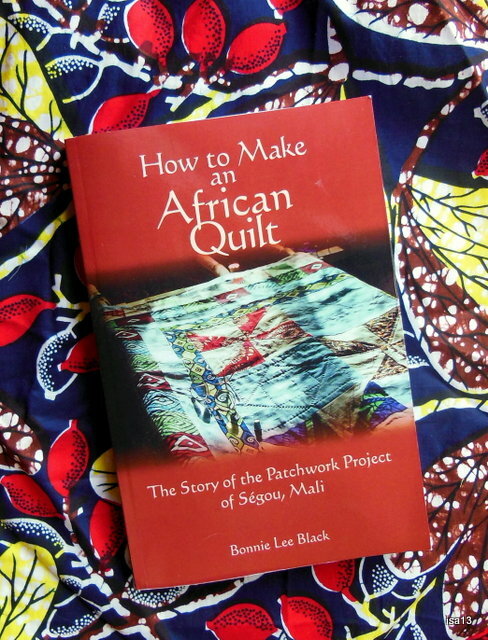 It is called How to Make an African Quilt: The Story of the Patchwork Project of Segou, Mali. The book is written by Bonnie Lee Black. This is a memoir, not a crafts book. It contains so much more than the making of an African quilt. Why am I telling you of this book in particular ? Because it touches me personally. The true stories Bonnie tells about her experience in Mali are about solidarity, friendship, determination, cultural sharing and hope. Bonnie created a women’s project that one cannot but love and feel proud of. This book is precious to me because it was written by a friend of mine, whom I did not know as a writer when I first “met” her. 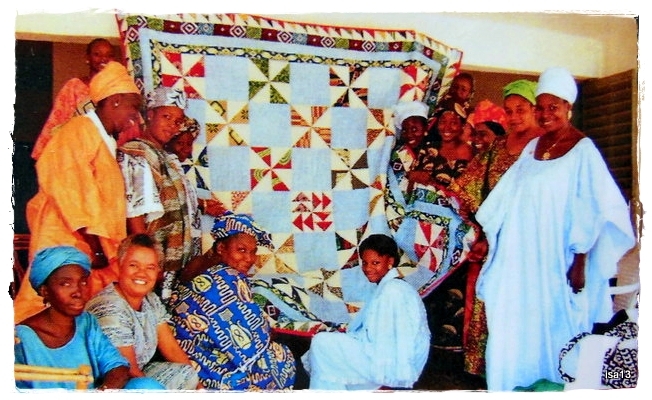 About 14 years ago, I responded to an item in a French quilters’ magazine that mentioned Bonnie’s Patchwork Project in Segou. 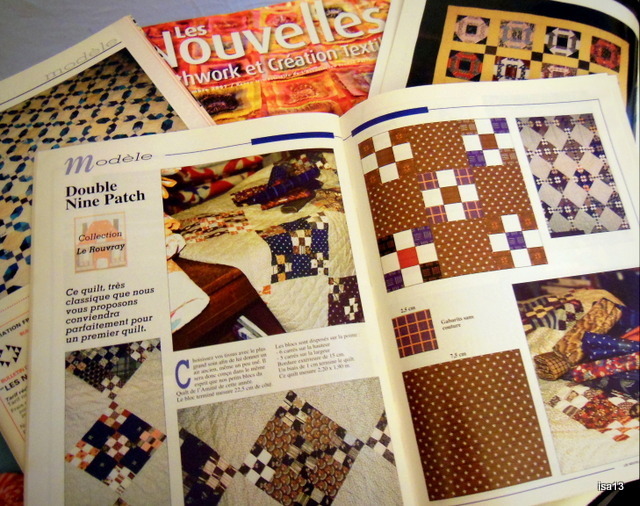 Bonnie was asking for used French quilting magazines with patterns she could use for her project in Mali. I found quite a few on my bookshelves that I sent her and her Malian friends. At that point we started writing to each other now and then, and we’ve kept in touch over the years. Guess what ? Today I have the immense pleasure and honor to welcome Bonnie Lee Black as my guest writer on this blog. I am also very thankful that she has offered to share her life-changing experience in Africa as well as some patches of her life. Thank you, dear Bonnie, for telling us more about your book, your quilting project in Mali and what your hopes are. “Thank you, Isabelle, for this honor to share with your readers my wonderful experience in Mali, now encapsulated in my new book, How to Make an African Quilt. The title, as you suggest, is really a metaphor for “connection” – cultural connection – and I’m hoping that theme comes through in its pages. This book is actually the sequel to my Peace Corps memoir, How to Cook a Crocodile (Peace Corps Writers, 2010), about my two-year service as a health and nutrition volunteer in Gabon, Central Africa. When I completed my service in Gabon, I decided to go to Mali (rather than return to the United States) and do independent economic development work there. I was in my early fifties and felt I still had more to give. Soon after settling in Segou, Mali (which is the textile “capital” of the country), I met a group of talented Malian seamstresses who asked me to teach them patchwork quilting. Well, that was a challenge for me because I’d never done patchwork quilting. But I soon taught myself from a quilting primer and happily created the Patchwork Project, which the women loved. In the book I share their stories and show their joy, especially as they sat together at the quilting frame (a makeshift contraption I made from lenghts of bamboo) laughing and singing as they stitched. Here is a link to the Wandering Educators website which shows a video about Bonnie’s book. How inspiring! The book sounds wonderful. It sounds like a project of the heart. Also, Isa, it made my heart soar to hear that blogging brings you joy as well. Thank you Kathy. You felt it right, Bonnie’s project comes from her heart. It gives me great pleasure to share it on my blog, one of the joys of blogging as I have learnt from you. Such an interesting personm who was so willing to help others make money and to have a better life. I enjoyed the video as much as I had time to watch.I’ll have to return again tio watch more. Isa, will look forward to you post to learn about what you have been doing while away from blogland. Olà Yvonne ! It is good to read you again, thank you for your visit and appreciation of Bonnie’s work in Africa. I also look forward to visiting you and seeing what you have been up to down in Texas. No doubt Summer is very hot there ? Take care and until soon. Yes,tis getting hotter and I’ve been without AC in the kitchen and den. Hope to get that fixed on Tuesday. Sorry to hear you have been sick, Yvonne, take time to rest now and get stronger. Best wishes to you. I read Bonnie’s book in two evenings!! She had been a guest at our Taos (New Mexico) quilt guild and I sat mesmerized as she showed the beautiful fabric from Africa and spoke a little about her just-published book. Naturally I bought it and would highly recommend it to anyone who quilts, loves, laughs, cries or cares about anyone in the world. What a delight!! Delma, what a lovely surprise to find you here ! Thanks a lot for sharing your nice moments with Bonnie at your Taos quilt guild. Lucky you. I read “How to Make an African Quilt” in less than a week, postponing some chapters just for the fun of anticipation 😉 My sincere wish is that many people will read her work and get inspired by it. Marie, how nice to take some time in your busy days to visit and comment on this post ! I am sure you will love Bonnie’s book and her other ones. Her site is a welcoming and interesting place to visit and it will give you more insight about Bonnie’s life experiences. Have a wonderful Summer, dear Marie. Welcome back, so nice to see you here Again. Hello Birgitte, thank you for your warm words. Yes, I enjoy being back in our little community and I look forward very much to visiting your site again, seeing what your response to Scott’s challenge has been (I could not participate alas). Just looking at Summer in Denmark through your eyes. Salut Isa (et Bonnie), et merci pour cette belle histoire. J’ai regardé aussi la site internet de Bonnie Lee, et bien sur, maintenant je voudrais le livre. Tu a raison: Bonnie est une femme formidable! Merci Janice, oui, Bonnie est une femme formidable qui donne beaucoup d’elle-même et avec tout son coeur. J’espère que tu pourras un jour lire son livre, ses livres. Passe un tout bon weekend. Un bon weekend à toi aussi, Isa. What an inspiring post! I am going to look for Bonnie’s book. Cultural connection and closeness is very near to my heart. I hope Bonnie’s efforts take the Good to further heights for these women. That picture is priceless. Joy on those women’s faces is so uplifting! Thank you for introducing me to the book. I have been around.. Need to post soon about everything good that has happened. Thank you so much for checking in and being so kind. I feel relieved and happy to read you, Sujata and look forward to knowing about all the good that has happened your way. I missed your inspiring posts and projects and quilts and just all you share with us. I agree with you, the joy on those Malian seamstresses and quilters tells a lot about their pleasure and pride of having learned about patchwork. Bonnie really started a wonderful project and I hope someone will continue it. Take care, Sujata and thank you for your encouraging response. It’s great to have you back Isa. People like Bonnie touch me deeply – unselfish giving for the betterment of others. I love the work that she does. I love the mystery that surrounds your friendship with her – very synchronous. Thank you so much Tammy. Your comments touch me. I know you might appreciate her previous book too which is about her work as a Peace Corps volunteer in Gabon – Central Africa. Bonnie taught health, nutrition and cooking primarily to local African women and children. “How to Cook a Crocodile” is a memoir with recipes. As for our friendship, it happened quite unexpectedly. An item in a quilting magazine, my love for African materials, an interest and enthusiasm for Bonnie’s project in Mali. All it needed then was a pen and some paper to write on 😉 synchronous as you say. I wish you and yours a pleasant Sunday, dear Tammy. Sandy from my small quilting group recently returned from a trip to Haiti where she helped teach local women there how to sew. They learned by quilting simple bags with the hope of selling them. I’ll share this post and Bonnie’s link with her. Quilting is about women sharing what little we have and what little we know in a process that enriches all our lives. You need not have bolts of new fabric or the expertise of a master to make a remarkable difference. It’s never just about the quilt. Isa,have you read ‘How to Make an American Quilt’ by Whitney Otto? It is one of the most insightful books I have ever read about women. (The movie is good too but only shows a fraction of what is in the book). Thanks for sharing Bonnie’s story. Thanks for your interesting comment, Amy-Lynn. I feel sure it was an enriching experience for Sandy too. Quilting groups are a wonderful place for sharing moments together; sharing what we feel and need of our lives. You are right, no new fabrics are necessary, used materials have a life of their own and by sewing them we are adding to their history. I read “How to Make an American Quilt” a long time ago and think I will reread it again. I liked it a lot but never saw the movie. It is a pleasure to share Bonnie’s story as we both hope that someone, some day, somewhere, as she says, will continue her project in Mali. I love it! I imagine you have left a legacy in Mali beyond your ability to imagine. I will look for the book! Thanks for your visit, worldquilter. I am sure Bonnie will be delighted to read your wonderful comment. A wonderful post, Isa. You have got many creative friends all over the world – and I admire all the creativity in your and your friend’s beautiful artworks. Thank you Truels, it is so nice to share with friends this passion of ours : quilt ! Very inspiring too. Dear Isa and her beautiful quilter-friends — I’ve just had a moment to read all of your responses to Isabelle’s June 22 post, and I am deeply touched by them all. Thank you so much for your heart-felt comments and the patchwork of connections they make across continents. For myself, as well as the Malian seamstresses I taught patchwork quilting to, I’ll say Thank you for this sisterhood! Hello chère Bonnie, I hope you had a pleasant celebration of July 4th. I have been away for a few days and was happily surprised to find you here as I came back home. I am very glad and grateful that our post was seen by many friends and visitors. It touched me too. “Sisterhood” is a good expression for these links that bring us together across continents. Doit être grand livre! Je suis heureux cette habileté de faire courtepointes sont réparti sur tout le monde. Bonsoir Matti. Oui, le livre de Bonnie est un grand et beau livre. Le patchwork n’a pas de frontières, de la Finlande au Mali en passant par la Suisse et les Etats-Unis, et beaucoup d’autres pays encore. Merci de ta visite et de tes mots.